My son, Mark, called me one Thursday morning in February 2004 to tell me a water main had broken the night before. Three water towers had emptied into his house and yard. Three sides of his house are under grade: one by three feet, one by six feet, and one by ten feet. Mark had almost two feet of water in his home. He was crying because his Dad had left all his music equipment in Mark’s basement family room and he thought it had all been ruined, including Mark’s grandfather’s fiddle. He asked me to call and have a large dumpster delivered to his house, which I did. He also asked if I could come over and help. I loaded my car with anything that might be useful such as a mop, cleaning rags, shovels and a 24-pack of pop. At the last minute I took three large pans of lasagna I’d made and frozen. Two and a half hours later I arrived at his house. All the musical equipment had been brought upstairs. The water had been pumped out, but his yard was very soggy and icy. Mark walked me from my car to the house and introduced me to several men. They were helping clean what could be saved and taking up wet and ruined carpets, furniture and other things. I didn’t know any of them, so assumed they were a crew sent by the city. Mark’s boss was adamant that he must come to work, but my son refused. He needed to be at home. My daughter-in-law said the helpers were men she worked with. When she called her boss to tell him she wouldn’t be in that day and why, he sent some of his other employees to help with cleanup. It’s a small company and the man isn’t wealthy, but he sent those men at his expense. About 4:30 p.m the men, who hadn’t eaten all day, came in to eat, and really appreciated the lasagna. I left to go home at about 7:00, and some of the men were still there working. 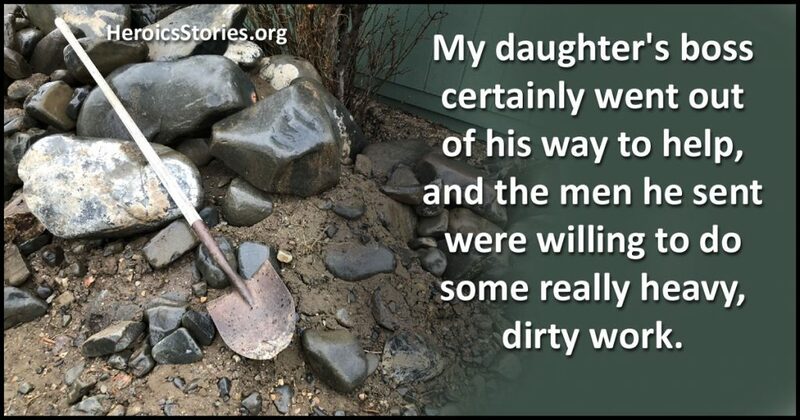 My daughter’s boss certainly went out of his way to help, and the men he sent were willing to do some really heavy, dirty work. None of them needed to help but they did willingly. I heard laughter off and on all day. That alone was helpful. All I could do was sit at the kitchen table and clean mud off small things like music stands and instrument cases. I was mainly there for moral support. The hard-working crew of helpers turned a disaster clean up into a manageable task. They earned my admiration and Mark’s gratitude. Above all, we’re so tremendously grateful to Alexandra’s boss, whose generosity provided the instant help so needed that day. I recently noticed that there is a typo in the graphic in the emails – it says HeroicsStories.o.org (note the duplicated s).